Our favorite style star gave a major country-chic moment at Dior. See Why Rihanna is the Supreme Slay Queen! There’s pretty much nothing about Rihanna or her life that could be considered “low-key.” Even her most laid-back sweatsuit and denim ensembles are sartorial sights to behold, whether she’s taking a cue out of Little Edie’s book in a silk headscarf and Supreme hat, or finding new ways to sport the biggest pieces of outerwear known to mankind. So naturally, fresh on the heels of her resounding success on the Met Gala red carpet, the pop star arrived at the Dior Cruise runway show in an equally attention-grabbing, cowgirl-inspired ensemble. Clearly even a famed French luxury label like Dior is trying to keep up with the Kardashians, as the brand held their Cruise 2018 collection runway show for the first time ever in Calabasas, California on Thursday night. And while all of the A-list stars, like Charlize Theron, Brie Larson, Laura Dern, and Demi Moore, were in attendance wearing their finest formal wear, the brand’s spokeswoman once again totally stood out, getting to wear a head-to-toe look from Dior’s latest collection even before it hit the runway. 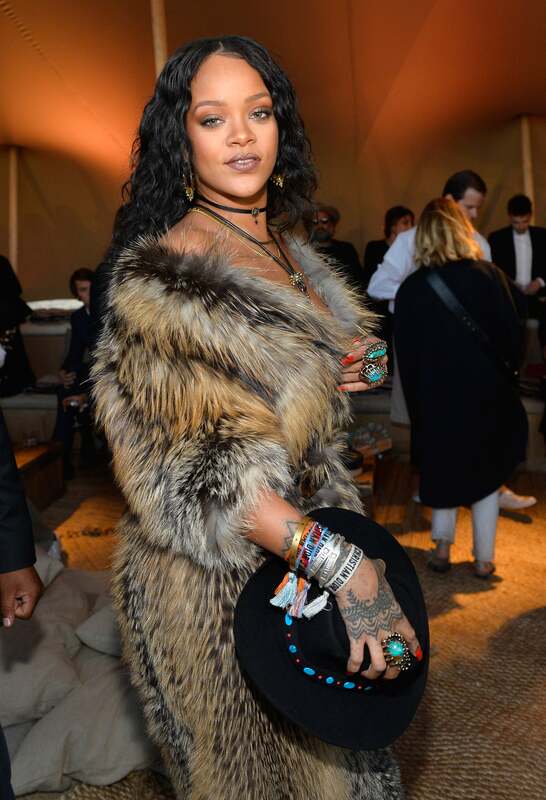 While most of her fellow attendees opted for glamorous gowns, Rihanna chose a full Dior look consisting of a natural fox fur cardigan which she wore slumped off her shoulders, cinched at the waist with a distressed wraparound leather belt and paired with distressed light blue jeans and black lace-up boots. The singer accessorized her Wild West look with layers of chokers and chunky turquoise rings and bracelets, one of Dior’s newest patchwork handbags, and a black turquoise-studded cowgirl hat, naturally. If you needed any further proof that RiRi is the sheriff of style town, she just gave it to you in spades.